I hope you’ve had a good week? It has been a crazy one here for one reason or another. I was working away Monday to Wednesday in Milton Keynes, styling a garden furniture shoot. Thankfully the weather was mild and sunny, the hazy last day of Autumn with the leaves glowing in the sunshine. So beautiful! The other thing that happened this week, is that a photo I shared on Instagram last weekend, got shared on their main account. This is a huge deal for me, I’m absolutely over the moon! (You can see my gallery here, do come and join me over there if you’re on Instagram). Every weekend, Instagram set a weekend hashtag project, on a particular subject. The briefs they set are really loose and easy to interpret for anyone across the globe – you don’t have a posh camera to take part, it’s all about creativity and capturing a moment. They then pick a handful of submitted photos to share in their gallery the week after. I love the way the project forces you to try something different. It reminds me of being back at art college. This weekend, it was #whpseasonal, and the photo I took of Lola was picked! My goal was to be featured by Instagram by the time I was 50, so I’m really, really happy to be able to tick it off the list (and try again of course!). Anyway, back to today’s photos. I was commissioned to take these for Reclaim Magazine, and my brief was to style my take on Modern Chintz. Which of course I absolutely loved! As you know, I’ve always been heavily inspired by florals. Big, blousy, chintzy florals, on fabric, on lampshades and as wall art. 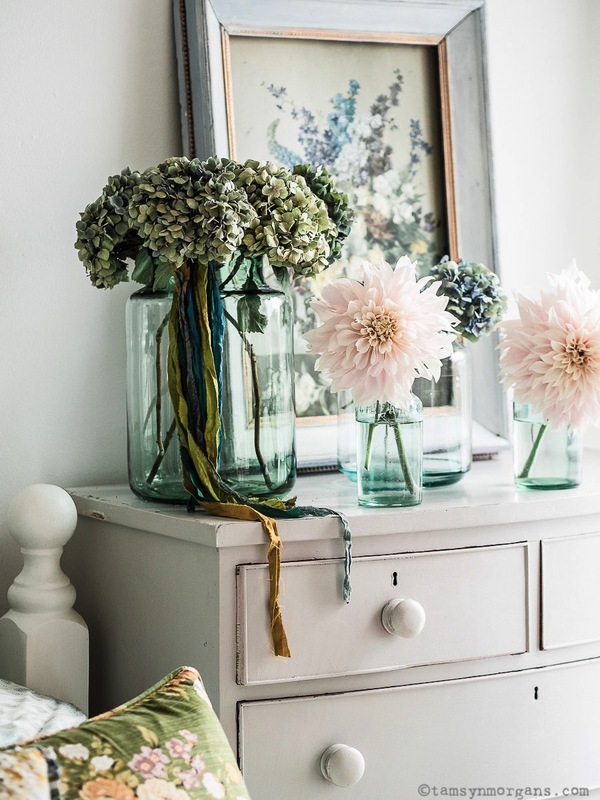 They have their moments when they go in and out of fashion, but these florals can still look so fresh and modern in a home, especially when used in a fun, whimsical way! Her are some of my tips for styling floral fabrics in your home. Don’t be afraid to layer up clashing florals and colours. 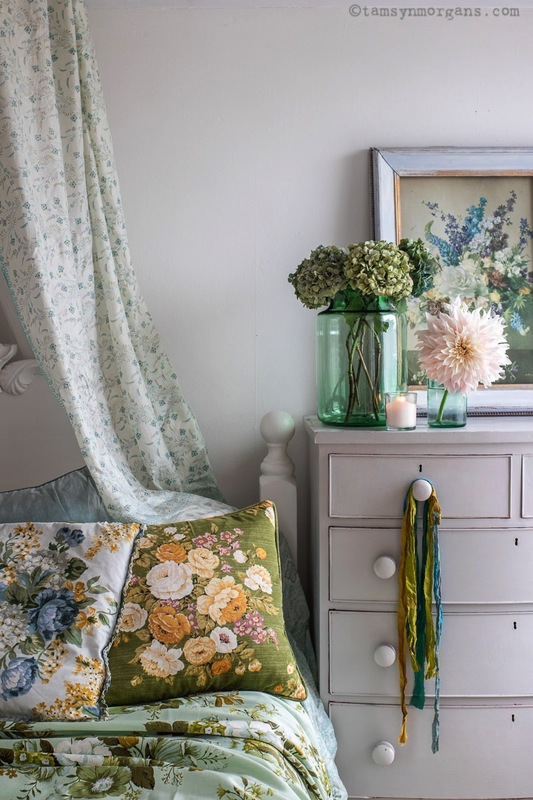 For a cosy winter bedroom, pile up different fabrics and frilly pillows. Make a simple bed canopy by hanging a hoop from a hook in the ceiling, and draping with long lengths of light fabric, such as this beautiful vintage sari. 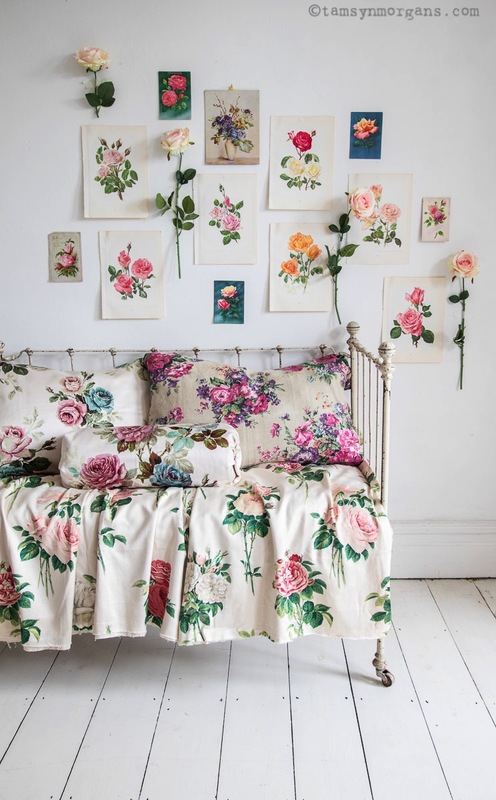 Pretty up a reclaimed French daybed by layering with beautiful fabrics and cushions. Go one step further and tape gorgeous old botanical prints to the wall for a beautiful alternative to wallpaper. Old frames are still relatively easy to pick up from junk shops and car boot fairs. 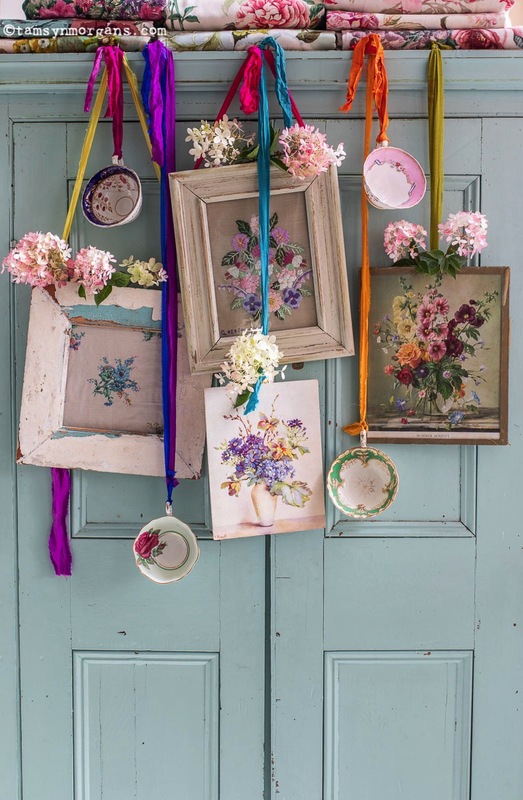 Repurpose them by framing sections of antique fabrics, to make a striking display. Hang them from colourful ribbon to keep them looking fun and vibrant. 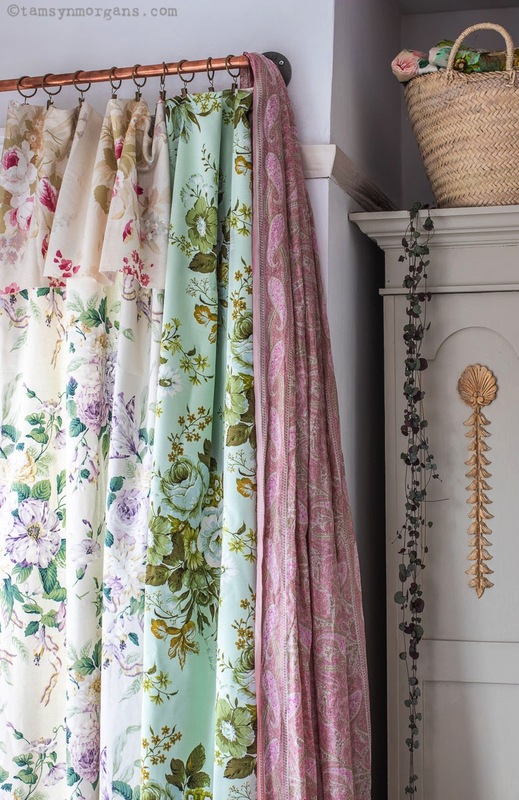 What I love about these copper curtain rails, is that they add an element of cool to all these florals, to stop them looking too flouncy. Add ruffles and layers, to create a beautiful window dressing. The Christmas issue of Reclaim is out of the moment, and I’m really proud of this one, so do try and grab a copy if you can. Have a wonderful weekend, I’m putting together some lovely independent shops and businesses for my 2018 Gift Guide, so do pop back – in case you missed it, you can see my last post here, with some photos I took for a lovely local business!